American Weldquip introduces a simplified, unique Nozzle Conditioner and Anti-Spatter bulk feed solution. 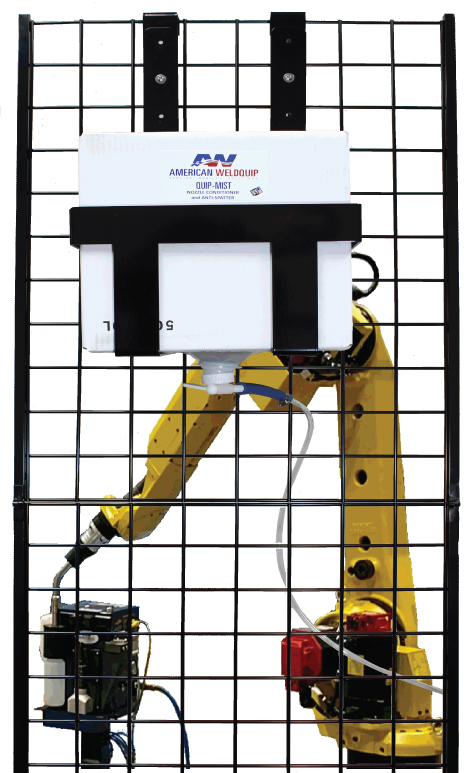 No more having to go into a robotic cell to change your anti-spatter fluid. The bulk feed system is designed to be mounted on the outside of the welding cell. It can be hung on the cell wall screen, bolted to a solid wall or simply hung on the top of the cell wall rail. Plus, the 5 gallon supply gives you extended time between refills. Changeover of refills takes seconds. Simply disconnect to supply hose from the on/off valve, lift and remove the 5-gallon Cubetainer from the hanger, install the new 5 gallon Cubetainer and reattach to hose to the (NEW) valve assembly and turn on.